2015 Panini Flawless Football largely continues the format first established in 2014 as a super high-end football release. Focusing on hard-signed content, each hobby box promises six autographs, two relics and two gem cards. Replacing one autograph with a gem card compared to last year, the box maintains a ten-card output. Offering a few new options, the base is enhanced with a variety of gemstones, including Diamond (#/20), Ruby (#/15) Sapphire (#/10), Emerald (#/5) and Diamond (1/1). Featuring the past, present and future, the signed options include multiple designs and themes along with on-card autographs. 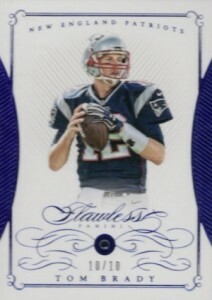 Flawless Victors Signatures focus on Super Bowl winners, while Memorable Marks offer retired greats and current stars. 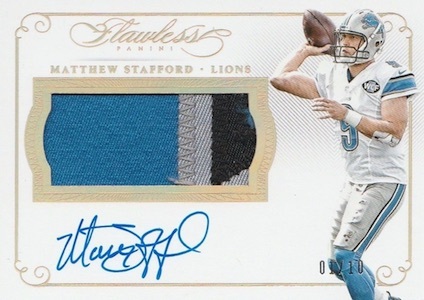 Great Patches Autographs (#/25) highlight the biggest stars and feature Blue (#/20), Ruby (#/15), Gold (#/10), Emerald (#/5) and Platinum (1/1) parallels. 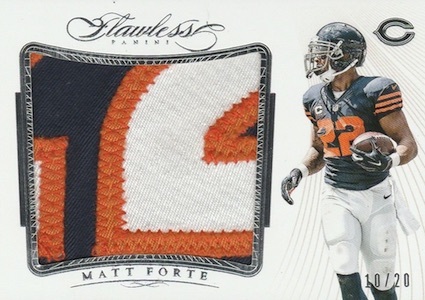 There are also Great Patches Dual Autographs that add a second relic to the design. 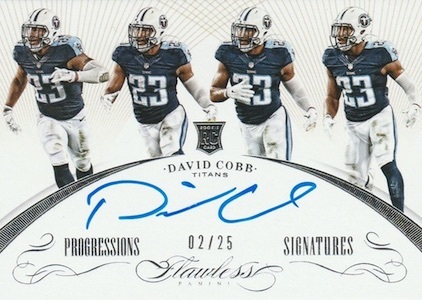 Highlighting top 2015 rookies, Rookie Patches Autographs, Flawless Progressions Autographs and Rookie Inscriptions all honor the key first-year players with on-card signatures. Live 2015 Panini Flawless Football cards can be seen on the Panini blog from before they were sent out for signing. 140 cards. Serial numbered #/20. 40 cards. Serial numbered #/25. 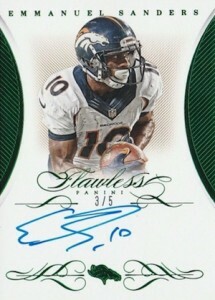 Only Emerald & Platinum Rookies has inscriptions. 30 cards. Serial numbered #/25. 29 cards. Serial numbered #/25. Card #23 only found in parallels. Cracked a case for my personal collection today. Sad! Panini should be embarrassed. Nearly $3k for a case and I might have $500 in cards to show for it. In a case, nothing of Gurley, Cooper, Winston nor Mariota. I personally don’t care about Elway, Fran Tark, Faulk or any other HOF’ers or past players. Massively disappointing product, considered these are “supposedly” hand ‘collated’. The little briefcases are awesome tho…just basically $3k card carriers. You are correct and im sorry to tell you but certain products do go to others. We just buy more then the small guys. Flawless by the box/case, while a beautiful product, fails to deliver value for money. Same goes for National Treasurers, Immaculate, Luxe and Black Gold. Designing and manufacturing a beautiful product is great but if you fail to provide a value for money proposition then you are out of business. Apparently this business logic does not yet apply to Panini. Couple lack of value with non-existent customer service, high rates of redemptions and incredibly long waits to fill said redemptions then one would believe that Panini’s business would suffer – again maybe they defy logic. I can only imagine what we have to look forward to with Panini holding all the cards for football this coming year. Again, this was an excellent personal, box break–no complaints here. BRETT FARVE 2015 PANINI WHITE BOX 1 1 FLAWLESS AUTOGRAPH HOF QB RARE! !MINT CARD!